My original intention with this series had been to cover the entire Wikipedia article and its arguments against homeopathy. Having barely finished discussing the Wikipedia introduction, however, I am finding the whole thing a little tiresome. Most of the Wikipedia argument (90 percent) boils down to the size of a homeopathic dose, which subject encompasses a fraction of what homeopathy is and how it works. The other 10 percent consists mostly of duplicity, dishonesty and dissing on 18th century language. In order not to belabor the point too vigorously, I would like simply to make the rest of my argument in this one very long post. So, here are a few more corrections that should be made to the Wikipedia page on homeopathy. I hope that for someone attempting to understand homeopathy or to understand the conflict between homeopathy and conventional medicine, these comments might be useful. A photograph of a vial of homeopathic pellets has the subtitle: “A homeopathic remedy prepared from marsh tea: The '15C' dilution shown here exceeds the Avogadro constant, so contains no trace of the original herb." The above claim is made solely on the basis of Avogadro’s theory of molecular distribution in a gas, postulated in 1811. Traces of the original substance have now been detected by material science in dilutions as high as 200C, and these results have been replicated. That dilution is equal to 1 part of the starting substance in 10 to the 400th parts of water. Clearly, the derived assumption that molecules always distribute evenly in a water solution is not true. Not strictly accurate, but close. Homeopathy is based not on a vitalist philosophy but a dynamist philosophy. The “vital force” is the archaic phrase used to describe the idea that a person is more than the sum of his or her parts, that something energizes us which is not measurable or isolate-able. As in other holistic disciplines, disease is seen to arise from disturbances to the economy of the organism. Therefore, symptoms are seen not as individual diseases but as expressions of a disordered system (dynamis) that comes before detectable disease. Recent research is suggesting that if the "vital force" is something that regulates health, something that can be out of balance and something on which homeopathic remedies can exert an effect, then "vital force" may be accurately translated as "allostasis," the deepest and broadest process by which the human body maintains life by reacting to the environment. The beautiful thing about an expression like the “vital force” or "dynamis" is that while it provides a basis for understanding the application of homeopathic remedies and assessing their action, one does not have to theorize about exactly what it is in order to apply the principles of homeopathy to a patient’s disease. Is the writer questioning that the individual human body is susceptible to certain influences? Like, say, measles? Or arsenic? Or that this susceptibility varies from person to person? Like how some people died from smallpox and some people didn't? Or why some people died from Vioxx and some people didn't? I don’t think so, because such a position would be ludicrous. The concept of susceptibility is exactly what the most cutting edge conventional researchers are working on right now in their development of drugs that take not only a person’s medical condition but also her genetics into account in treating her disease. It's a pretty basic concept and not at all controversial in medicine. Again, not sure where they came up with this one. 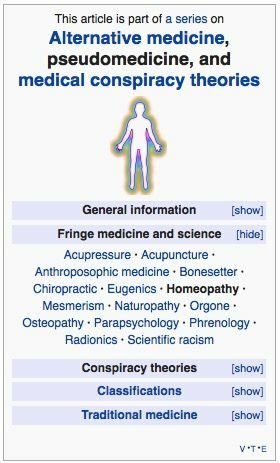 A cynical person might think the Wikipedia writers were doing this to make homeopathy seem ridiculous. Let's give the Wikipedia writers the benefit of the doubt for a moment. They are still in way over their heads. Because they have never read the homeopathic literature with the honest desire to understand it, they are mixing up all sorts of concepts in one completely nonsensical statement. For example, the idea that I expressed above about the "vital force" being roughly equivalent to the body's allostatic mechanisms is also an idea that Hippocrates had thousands of years ago. Hippocrates, of course, would have expressed "allostasis" as a "balance of humours" (water, fire, air, earth), another theory of health that Wikipedia labels as "discredited" (as if that were necessary). We can parse old language by the standards of new science, we can make Hippocrates seem ridiculous, and we can pat ourselves all over the back for being so enlightened. Or, we can recognize that people like Hippocrates and Paracelsus and Galen and Hahnemann had a very deep understanding of health but did not have our precision tools. Homeopathic "miasm" theory, despite the funny word, is a complex understanding of chronic disease as the interaction between genetic susceptibility and germ theory. After all, what is a germ if not an invading entity? And what determines whether a particular germ makes you sick? Both how well you take care of your body (hygiene) and your inherited makeup (genetics). Some people are susceptible to certain types of illness, others to other types of illness, both infective and non-infective. What the writers don’t tell you here is that Hahnemann is conventional medicine’s Father of Hygiene. It was Hahnemann who alerted (Western) medicine to the fact that people living in certain conditions were more likely to contract and spread diseases that proliferated in those conditions. In fact, it was conventional doctors who didn’t recognize the idea of microbes until the microscope was invented some years later and they could actually see with their eyes. And it took several decades after Robert Koch documented the spread of germs for doctors to believe they needed to wash their hands before surgery; his own surgeons killed President James Garfield because they refused to believe in the newfangled theory of germs. One is reminded a little too much of people who don’t believe in homeopathy because they can’t see the dose. Whoa, a true statement! Somebody at Wikipedia has been napping. Hahnemann took ten years off from practicing medicine because he could not conscience bleeding and sweating people to death, nor giving people medicines that had never been tested as to their effects. That was another one of Hahnemann’s contributions to conventional medicine, the idea that we should test our drugs before we use them on people. I couldn’t possibly make this up. They revere Hahnemann in medical history classes, and he has the only monument to a physician in the United States of America, but they don’t teach medical students that Hahnemann also founded homeopathy. Actually, "allopathy" simply means, "the therapy of anything that works (or doesn't)." And your point is ...? Don’t you just love the picture of the remedy bottle from 1920? I wonder what the writers are trying to suggest? To clarify, an insoluble solid that is meant to produce a homeopathic remedy is first ground with lactose for three hours in decreasing concentrations. The resulting “triturate” is then diluted in water or alcohol and succussion is applied after each dilution. This is compatible with producing nano-particles of the original substance for medicinal application. And we come again to the only real argument in all 30,000 words and 234 references, the argument we will see hashed and rehashed in the interminable evidence section at the bottom of the page. It is the foremost and really the only concern of the medical fundamentalists. They are invested in the idea that a dose cannot be medicinal unless it is also potentially toxic. This is a very deep assumption built into conventional medicine: if it can't hurt you, it can't help you. I think this concept will go down in history as one of the sickest ideas embraced by Western culture. Oh, now you think it's reasonable for someone to rely for understanding on the knowledge of their time? How generous. As reasonable as it may have been, however, there is no evidence that Hahnemann made such an assumption. He commonly used dilutions below Avogadro's constant, as do modern homeopaths. Yes, this is the prediction made by Avogadro regarding the distribution of molecules in a gaseous solution. Avogadro makes no prediction as to the distribution of nano-particles in a liquid solute that displays non-gas properties like surface tension. The presence of nano-particles of the original substance have now been detected by the instruments of physics in remedy potencies as high as 200C. All the examples of how high our dilutions are come to naught in the face of demonstrable clinical results and positive studies, but it is the sticking point for the fundamentalists. Diluting one molecule in the “observable universe,” as they say, still doesn’t prepare the substance homeopathically, neither with trituration (grinding) nor with the energy added in the form of succussion. These are crucial to the preparation of a clinically effective homeopathic remedy, as shown by recent material science studies. Otherwise, every sip of water we drank would be a homeopathic remedy! But because our tap water is not prepared homeopathically, it does not exert a homeopathic effect (unless it's full of industrial nano-particles). Spiritual? No. Dynamist. But “spiritual” sounds so much more airy fairy! The linchpin here is “conclusively.” Conclusively in whose interpretation? It has certainly been conclusively demonstrated to this homeopath and in a number of well designed studies. This is the section where the writers try their darndest not to admit that Hahnemann was the first western physician ever to demand that medicines first be tested before they be used on patients. Some naughty homeopath has been in here pointing out that fact, in the middle of which a fundamentalist reminds us that the dilutions are too high to have a molecule left. Yawn. The b.s. word keeps bubbling at my lips the more I read this stuff. This writer has never participated in a proving and has no authority to make such statements. Modern provings contain both subjective and objective data, sometimes including laboratory data, and are often both blinded and placebo controlled. They can also use measurable doses of the original substance. As in conventional clinical research, there are good provings that yield useful information, and there are weak provings that yield vague and clinically impossible information. That has more to do with the researcher(s) than it does with homeopathy in general. Oliver Wendell Holmes was a jurist and writer, not a physician, definitely not a trained homeopath. He obviously never read a proving if he thought they were “vague” by conventional standards! Holmes’s writings on homeopathy are a disgrace to his otherwise good name. He knew nothing about homeopathy except what a friend of his had told him. Holmes’s own physician was famous for stating that unless a doctor bled his patients he didn’t deserve to practice medicine. And, the effects of provings have been repeated on different subjects, one very famously at a weekend conference a couple of decades ago. “ ‘Classical homeopathy’ generally involves detailed examinations of a patient's history and infrequent doses of a single remedy as the patient is monitored for improvements in symptoms, while ‘clinical homeopathy’ involves combinations of remedies to address the various symptoms of an illness." Once again, the writers are out of their depth. Classical homeopathy generally sees the prescription of a single remedial substance, prescribed on the totality of the characteristic presenting symptoms and uncombined with other substances. “Clinical homeopathy” is homeopathy practiced in a clinical setting. It has nothing to do with combination remedies nor treating symptoms individually, none of which are considered classical or Hahnemannian or even "homeopathic" in application. Kinda like the Wikipedia writers publishing all this babble about a 200-year-old medical discipline they have never studied? Dear Reader: If you have made it this far, I commend you for your efforts and apologize for your lost time. May you live and prosper!